BJ Homer: Tri-Pic is in the App Store! Tri-Pic is in the App Store! Tri-Pic is finally in the App Store! I've been working on this as a side project for a few months, and finally got around to finishing it up. 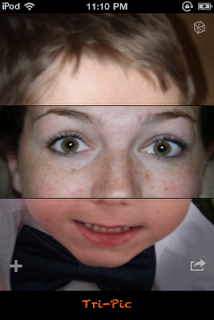 It's a fun little app to mix faces and share them via email, Twitter, Facebook, and other services. And it's available now in the App Store, free. Tri-Pic started out as a project to help my brother with a marketing assignment. In the class they had to come up with a game and do a bunch of market research on it. But it had to be a real game. They were allowed to use an iPhone app only if they knew someone who could actually make that app. As it turns out, my brother knows a guy who can make apps. The arrangement was pretty simple: I'd make the app, they'd use it with for class and get the grade, and then I could do whatever I wanted with it. Awesome. I got the basics done in time for them to finish the course, but it never felt quite ready to put in the App Store. The biggest problem was the initial experience. It's fun to mix faces, of course, but when you first launch the app, it doesn't have any faces. I could have included a bunch of stock faces, but it's at least twice as fun to mix faces of people you know, so I really wanted to avoid stock faces. But the first experience with the app was pretty terrible: you spent at least 2 minutes finding a half-dozen good pictures to use and cropping the face in each one before you ever got to mix any faces. Two minutes of tedium isn't a great introduction to any app. So I added face detection using OpenCV. Tri-Pic will scan your photo library and look for faces, automatically adding them to the database. And even better is that on devices that support multitasking, this detection can continue in the background while off browsing the web or tweeting about Tri-Pic. The initial experience went from super lame to magical. Is Tri-Pic going to earn an Apple Design Award? Not likely. Nor is it going to change the world, or fix the economy, or anything else monumental. But it's fun, it's free, and you'll at least get a smile or two out of it. And really, who can't use a smile? P.S. If you download it before the next update is approved, you may catch a reference to a previous working name. Let's just call it an easter egg, and not a really lame error, okay?